Bacon is the candy of meats. Who doesn't love bacon? 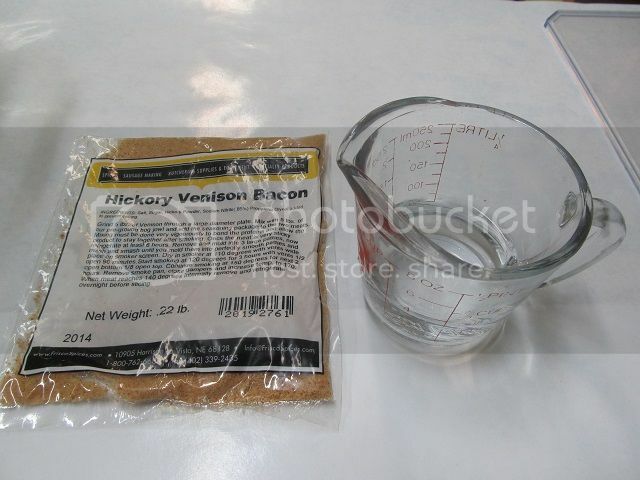 I received a variety of products from Frisco spices http://www.friscospices.com/ Included was the spices to make ground and reshaped bacon from ground meat so Im making a couple batches of the hickory bacon. 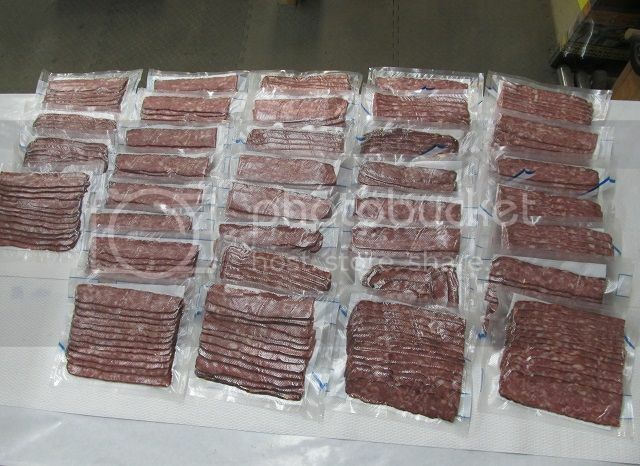 Each packet makes 10 pounds of bacon so I am making 10 pounds of goose bacon and 2, 10 pound batches of venison bacon. The instructions on that packet are pretty straight forward. 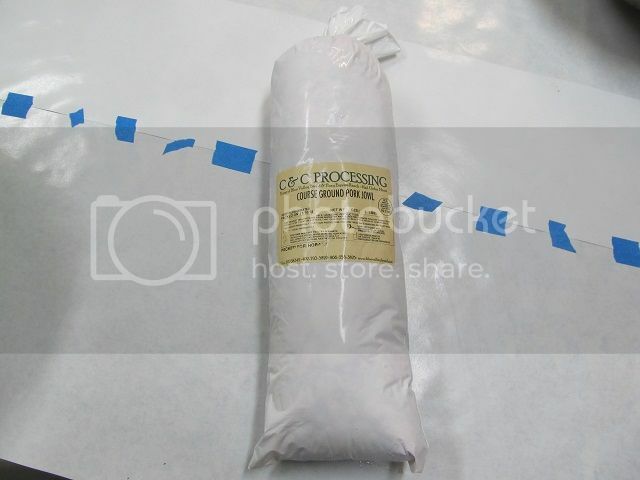 Mix 5 pounds of goose, duck, deer, elk, moose, bear, etc with 5 pounds of fatty pork or Frisco's course ground pork jowl. 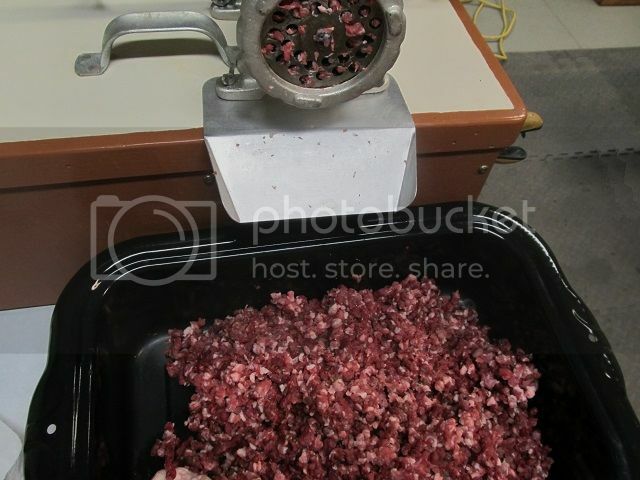 The first batch is venison and pork. 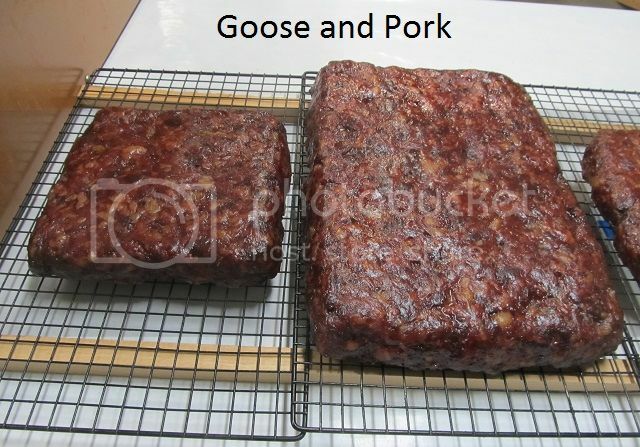 The second batch is goose and pork. 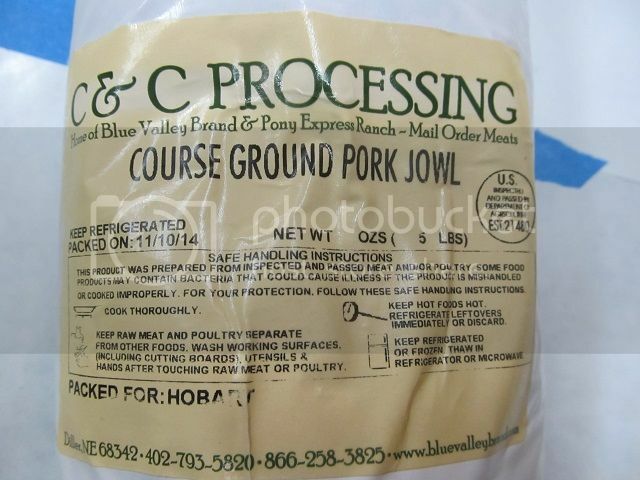 Im using some pork jowl that I cubed up as well as some of the ground jowl from Friso Spices. 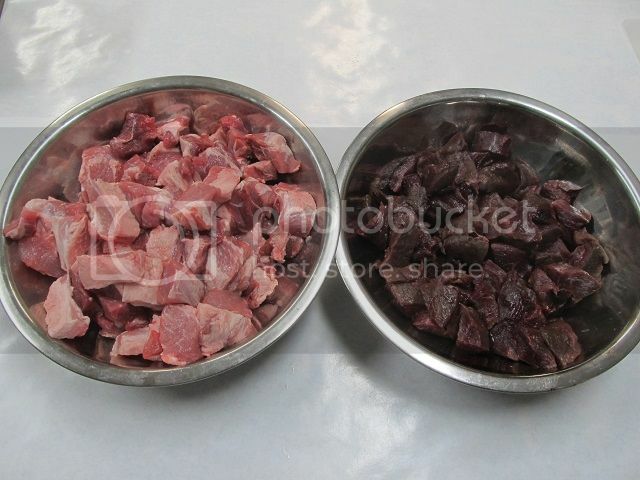 The pic below is with the deep purple goose meat on the right. Im using a 3/8 grinder plate. The instructions don't mention mixing the spices with a little water but I find I get more even distribution of spices and avoid over-spiced areas buy adding a bit of water. In this case I use 1/3 cup of cold water. The spices/water and the meat prior to cranking the mixer. After 10 minutes of mixing. 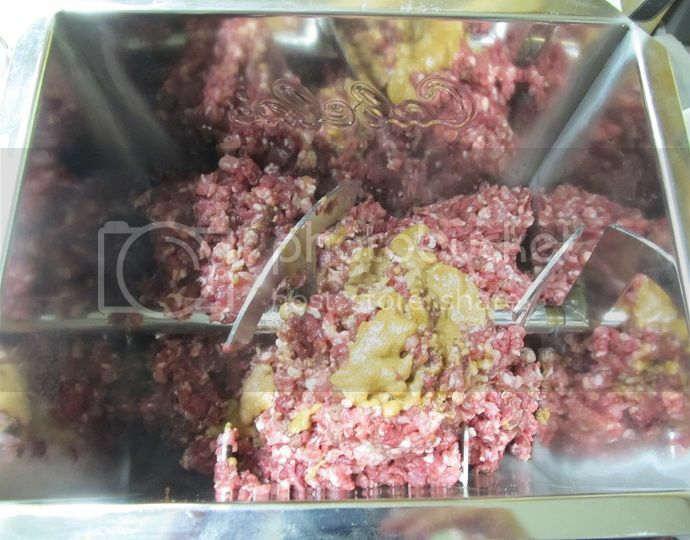 Lots of mixing is required to bind the meat and spices/cure so it holds together when its sliced and fried. 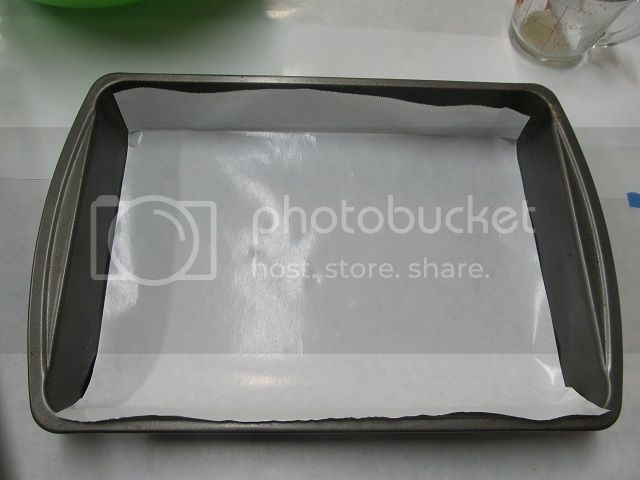 For consistent shape/thickness I using a 9 x 13 cake pan and an 8 x 8 pan lined with waxed freezer paper. 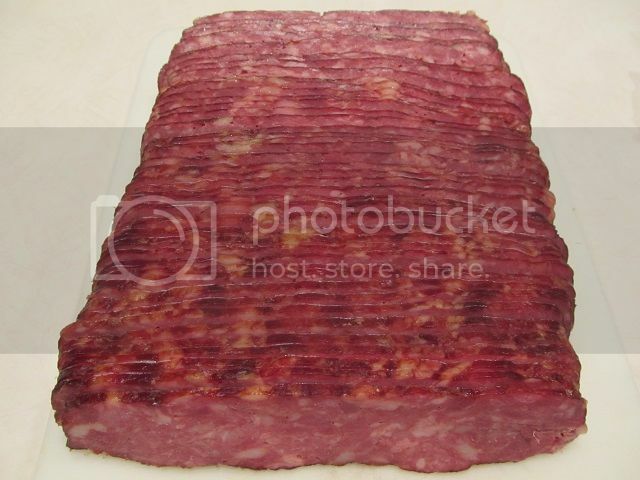 I don't like to place salted/cured meat against metal and the paper makes it easier to remover the meat from the pan. 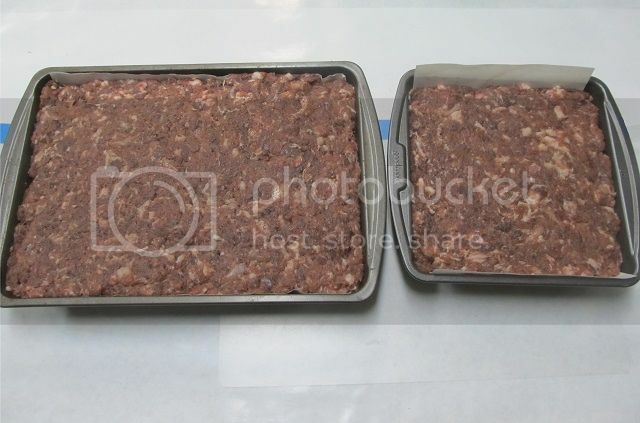 The 10 pound batch fills both pans nicely. 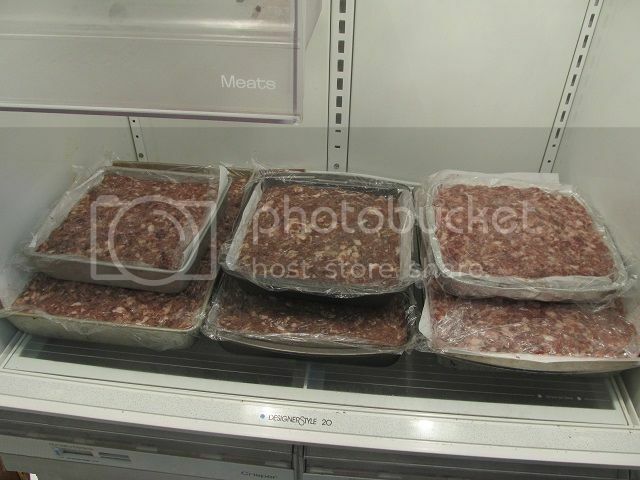 Then all 30 pounds of bacon are punched down to remove any air pockets and then covered with plastic wrap and placed in the cooler overnight to cure and take shape. 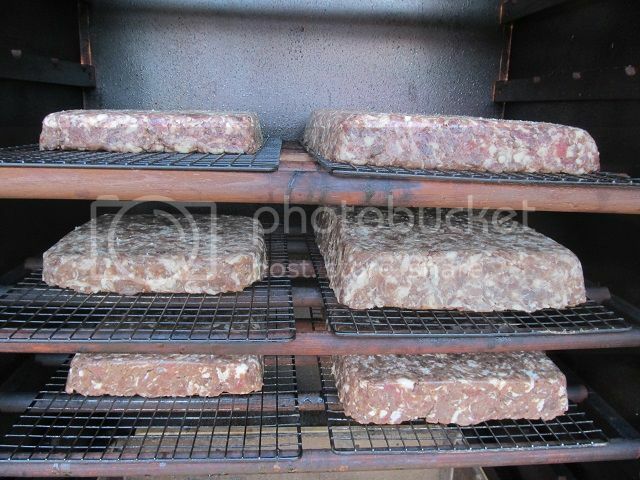 The next morning I preheat the smoker to 110F and place the pan shaped "slabs" of bacon on racks for smoking. 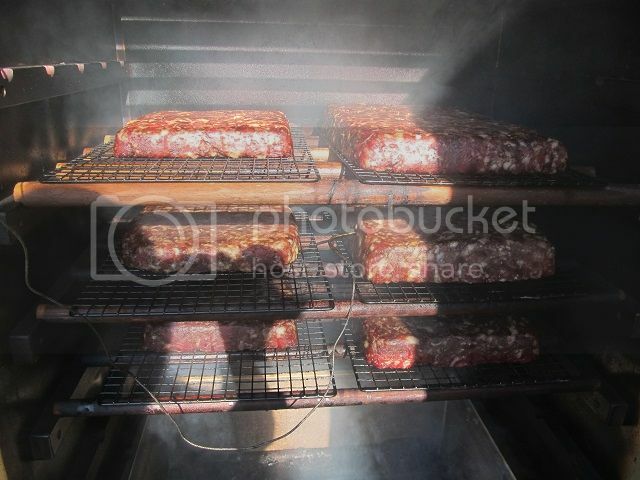 The first hour and a half will preheat the meat without smoke. The smoker vents will be full open. Then I increase the temp to 120F and add some large chunk hickory to the fire box and close the vents half way and smoke for 3 hours. 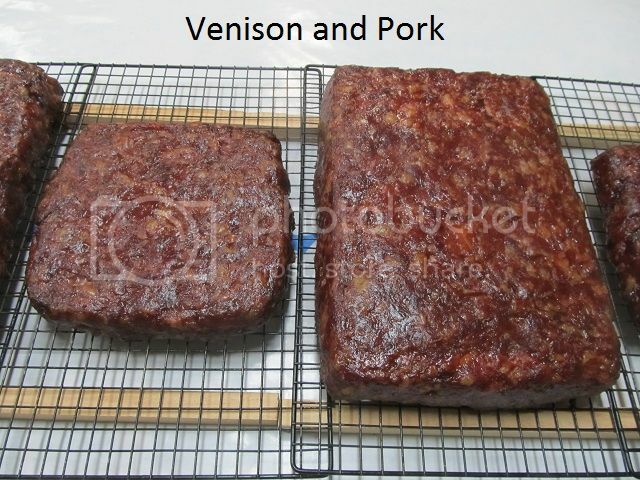 The temp is increased to 150F for a couple more hours and then the temp is increased to 170F until the internal temp of the meat reaches 140F. The meat takes on a deep smokey amber look. 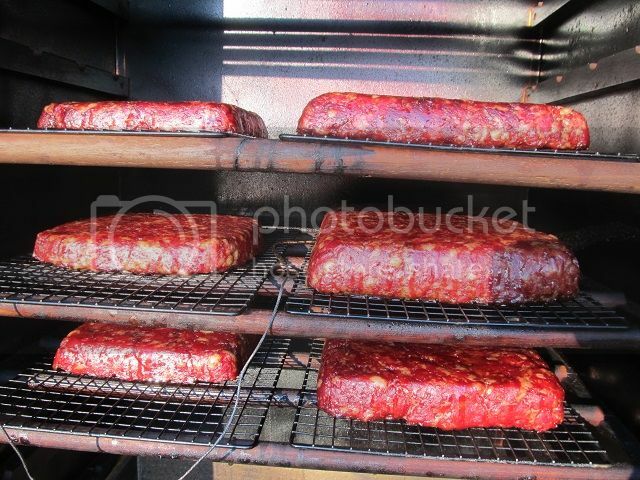 The meat is removed from the smoker and allowed to cool to room temperature and then removed to the cooler. After a night in the cooler, its time to slice it up and fry to check out the grinds, distribution and flavor. Both the goose and venison bacon are a smash hit. Perfectly seasoned and just enough hickory smoke. I can see a lot of BLT sammies in my future. 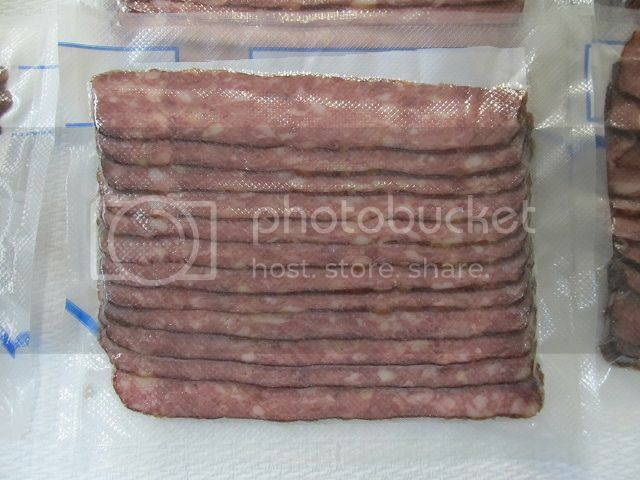 The bacon is then packaged in slightly less than 1 pound packages using the home butcher's favorite tool, a vacuum sealer. The total reward for my efforts. Frisco Spices Hickory Bacon seasoning is a real winner. Its a great way to use trimmings from any number of species of game animals. If you have a grinder and smoker, give it a try. 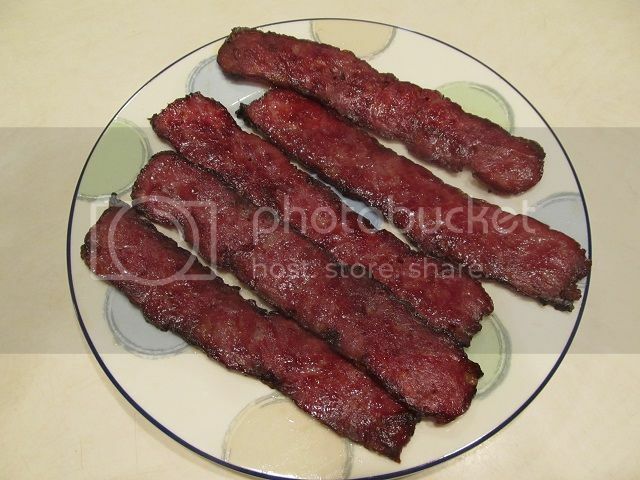 are you using an electric smoker for making the bacon. looks good to eat. No electric for me, Propane and large chuck whole woods for me. I dont care for electric smokers as I smoke in quanitties too great for electrics. My smoker has a 100 Lbs capacity. Looks great! I'm most definitely going to make some. Thanks for a great tutorial. I'm so doing this! Looks awesome, thanks for sharing. Well I've got 4 deer in the freezer and two more tags. Looks like I'll be filling both of those so I can give this a try. Thank you!!!! Thanks a bunch for turning me onto this Ron. I've made two batches of now and gotten rave reviews. Will for sure be doing more. I start it in my LP smoker for the low temp part then switch to the Green Mtn pellet grill to finish up, a 20lb batch fills the grill perfectly. I think I didn't mix the second batch of goose quite enough. 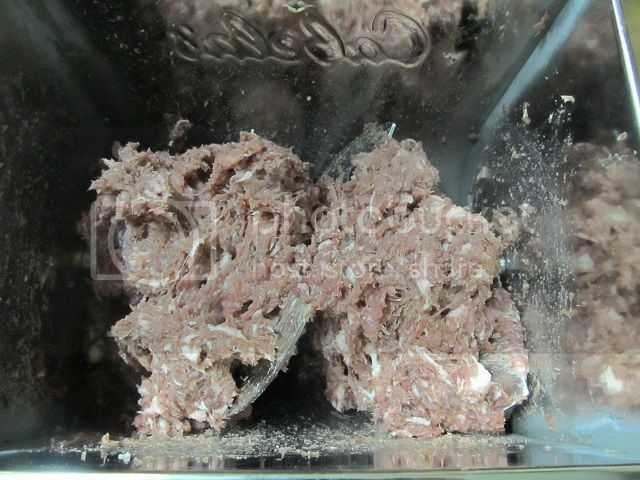 Tastes great but it doesn't hold together too well. Elk and antelope have both come out perfect though. Man does that look great. I think I can even smell it all the way on the east coast. 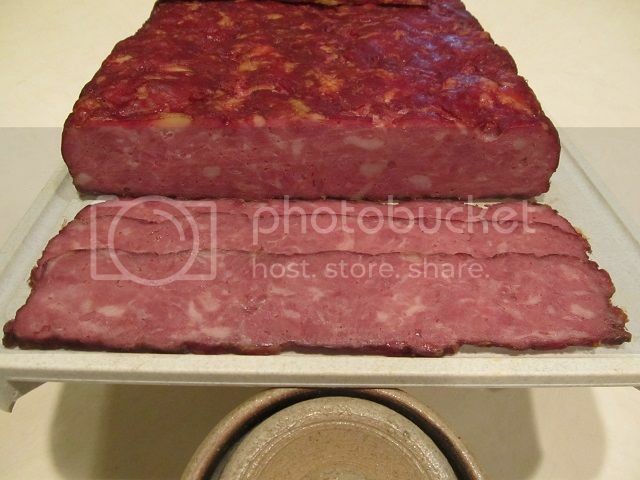 Yo Ron - What I wouldn't pay on St Judes for a lb of that bacon.